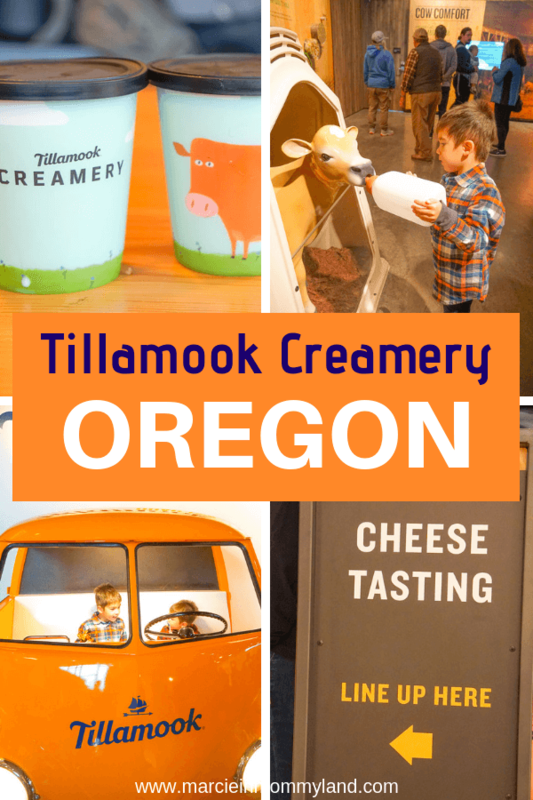 The Tillamook Creamery is located in Tillamook, OR (about 90 minutes west of Portland.) It’s on the Oregon Coast, which has a ton of fun things for families. The Tillamook Creamery features a FREE self-guided tour where families can see how cheese is made. When you enter the building, head up the stairs to start your Tillamook cheese factory tour. At the top of the stairs, head to your left. 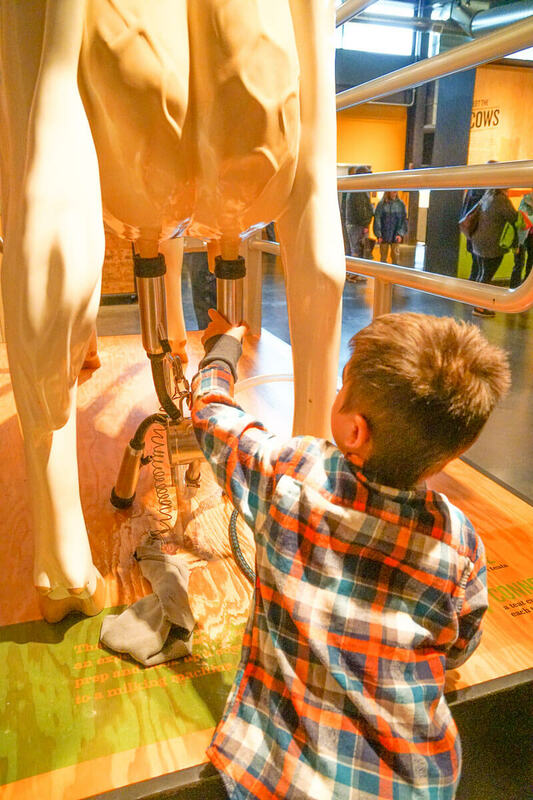 This is where kids can get some hands on learning about where milk comes from. 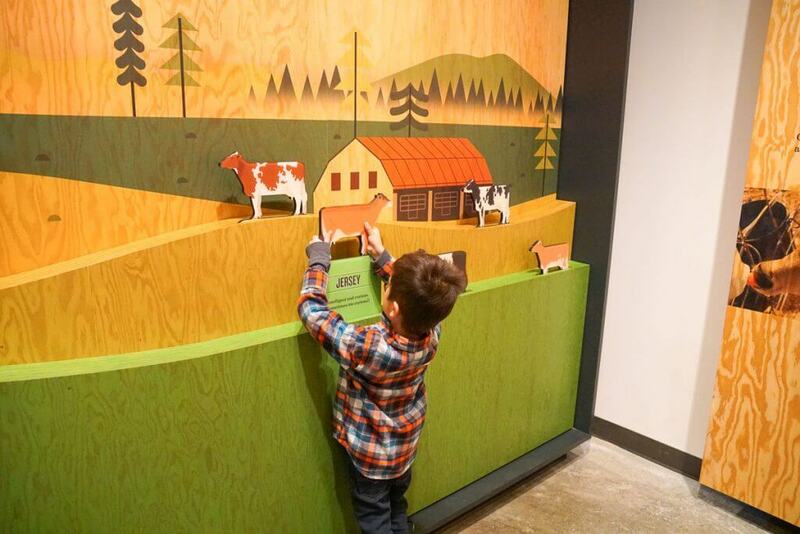 Up against the wall, there’s a cool area where kids can learn the names of different cows. 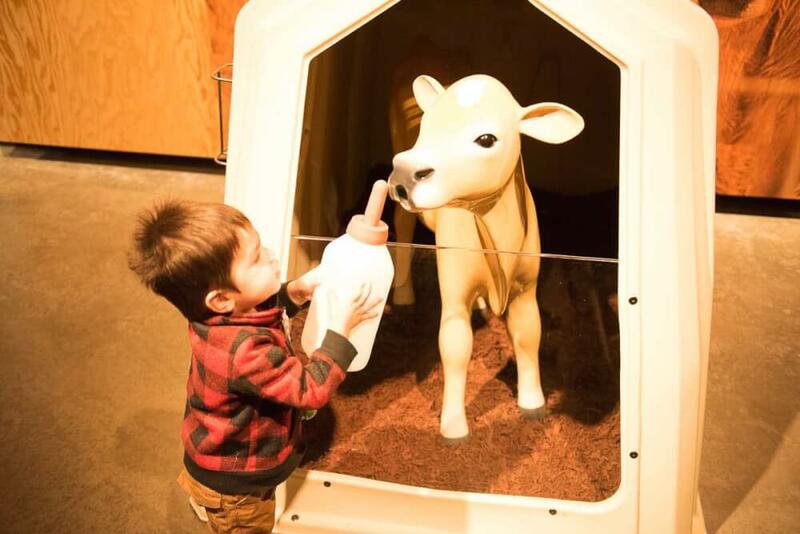 Then, kids can grab some bottles and “feed” a display cow. This was a huge hit with my 2 year old! Moving on, there’s a display that features a prickly brush and kids can see how cows scratch themselves when they are itchy! It’s kind of like a huge bottle brush! 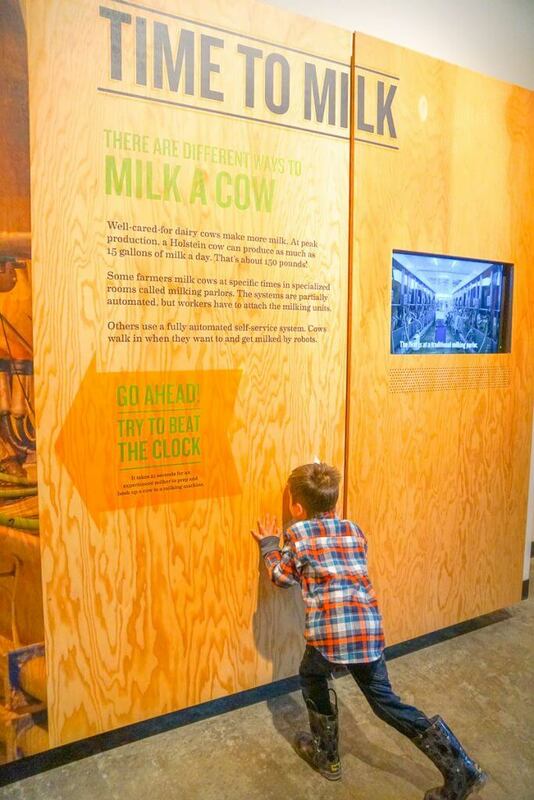 And one of the coolest sections is where visitors can see if they can “beat the clock” as they milk another display cow. My 4 year old could have spent 10 minutes here trying to shave off his time! Finally, we noticed a little peep hole at the end of this kids area. When we looked inside, we saw a little toy cow in a diorama. This is just the first of several we spotted throughout the day! Turn left out of the kids area and you’ll see a wide hallway with huge windows. This is where the magic happens! Each step is numbered (on a super cute milk can!) and labeled so it’s easy to see where to start. There are display boards that explain what’s involved with each step and what each machine does. Plus, there are signs hanging over most of the machines with their names. 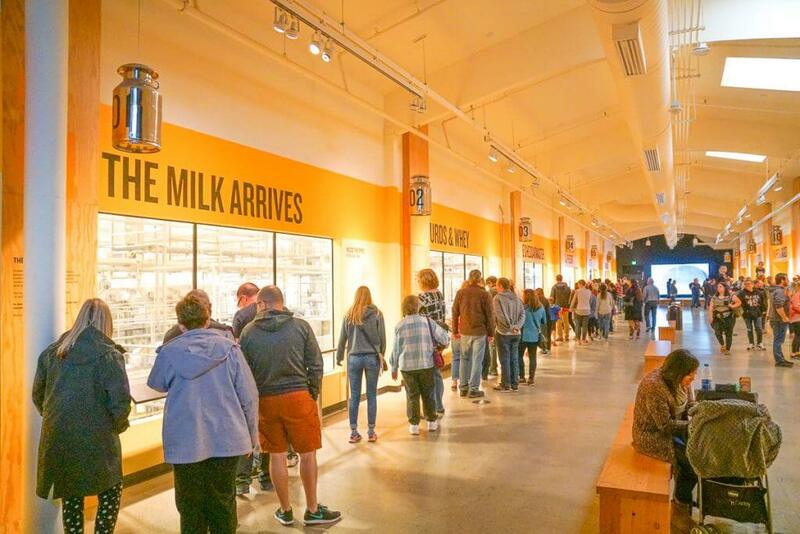 Halfway through (at the end of the hallway) is a large screen that shows how Tillamook ice cream is made! There are a few rows of benches to sit and watch the documentary. 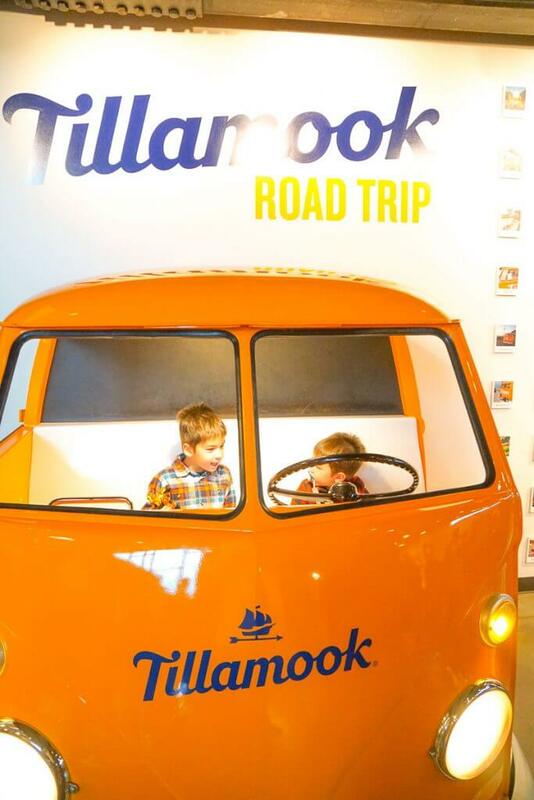 Our favorite Tillamook ice cream is Udderly Chocolate, so the kids were glued to the screen! Then, you’ll continue on to see how the cheese is cut and packaged. Hint: it involves a blue octopus! So, this may be worth the drive in itself. Get in line and you can sample an assortment of cheeses. The area is a big square and the line divides so half the visitors go to each side to try the samples. They have toothpicks and you are supposed to throw them away after every sample. 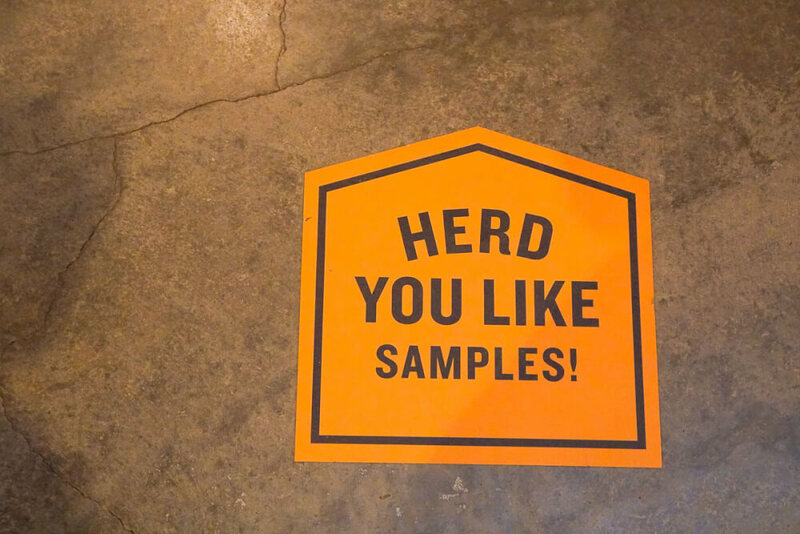 After you finish your samples, you are encouraged to go down the stairs that lead directly into the Tillamook Gift Shop! As far as gift shops go, this one is pretty comprehensive. It’s like the dairy section of your local grocery store meets an indie toy shop. Yes, they have a large freezer section featuring tubs of Tillamook ice cream and ice cream bars. Perfect for sharing with family and friends! The Pacific Northwest Apple Cider ice cream looked awesome and I’m adding that to my grocery shopping list this week! If you like cheese curds (they are soooooo good!) this is a great place to grab some. They also sell huge blocks of cheese, individually wrapped cheese, and all the kinds of cheese you could want. Plus, they have a small section called Maker’s Reserve where they feature cheese you can’t find anywhere else. While we were waiting for lunch, I took the boys to the gift shop and found a corner that was a kids play area! 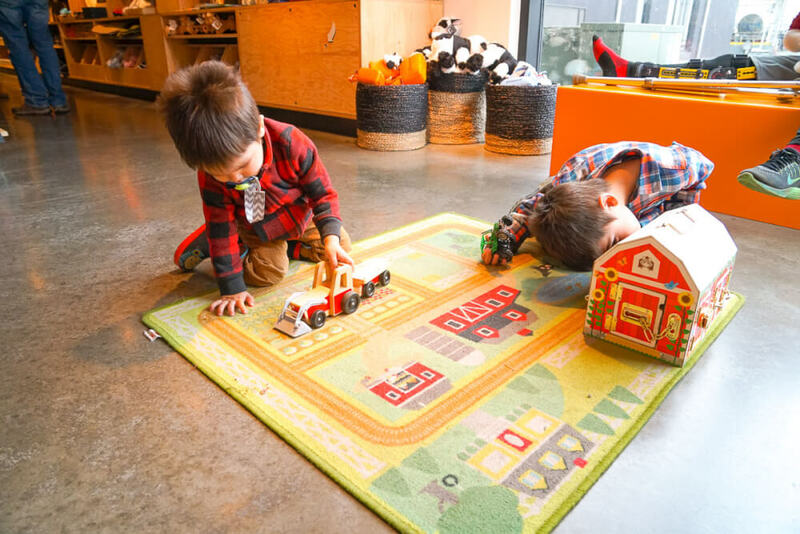 There’s a play rug and some farm toys. And there are benches for parents. Plus lots of stuffed animals waiting to be snuggled! And the kids section was massive! Lots of Melissa and Doug, Green Toys, board books, and all kinds of farm-related products. 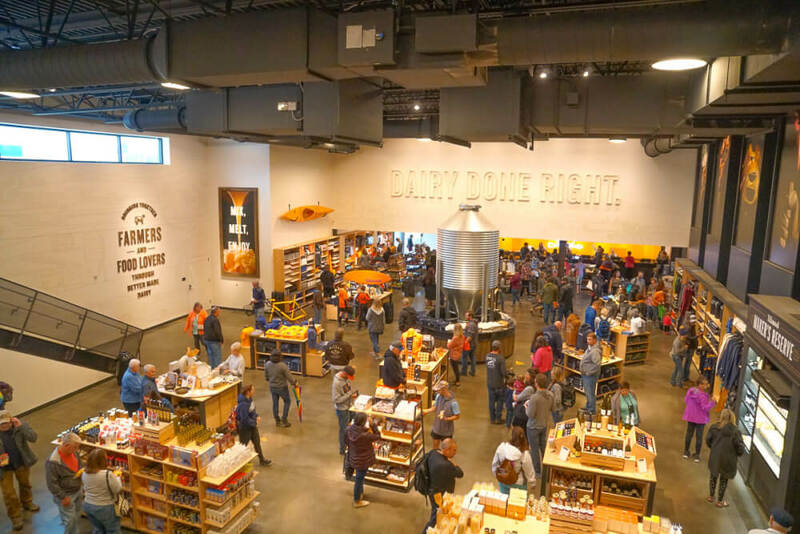 The Tillamook Creamery has a large Food Hall featuring all kinds of dairy yumminess! The Food Hall serves breakfast, lunch, and dinner. These items are made to order and most of them have Tillamook cheese! We tried the Mac and Cheese, Grilled Cheese and Fries, Tillacubano, and the Tillamook Madame and they were all outstanding! See the full menu here. 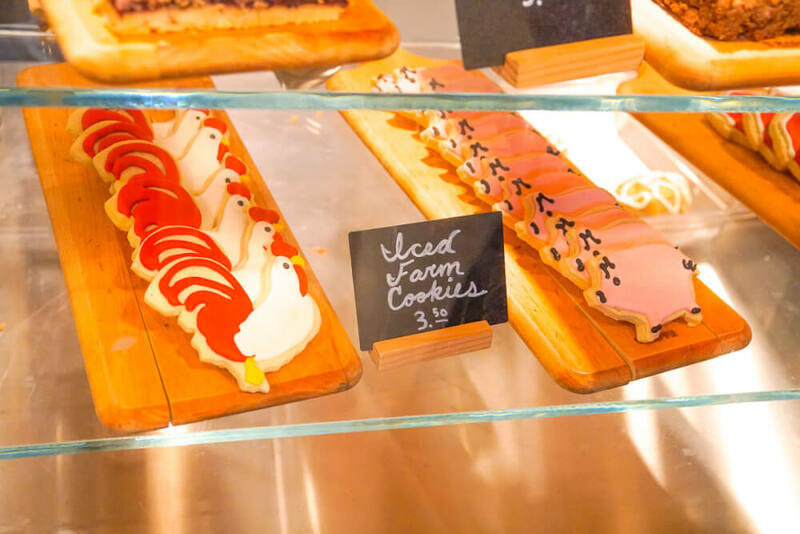 There’s a little bakery area with fun treats and coffee drinks, too. Oh, and did I mention they have beer, cider and wine? 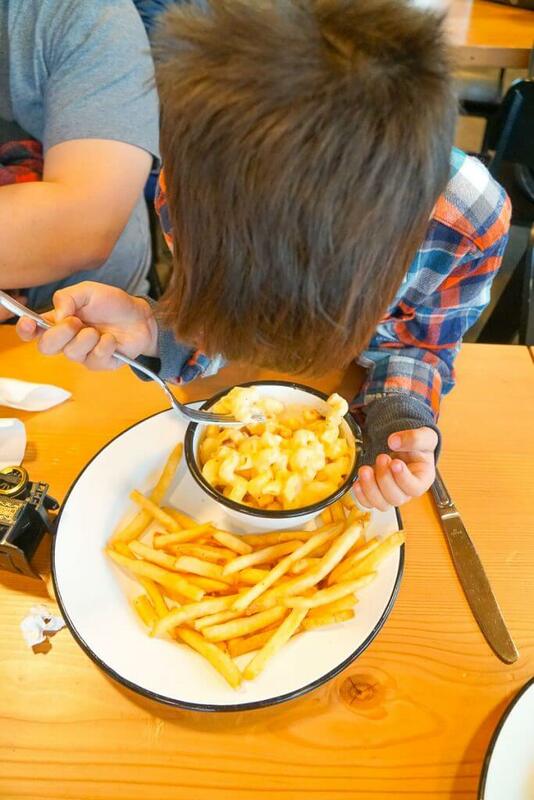 I suggest ordering a kids meal to save a little money. Plus, the meals come with this reusable to go cup for milk that is just the right size for little hands! 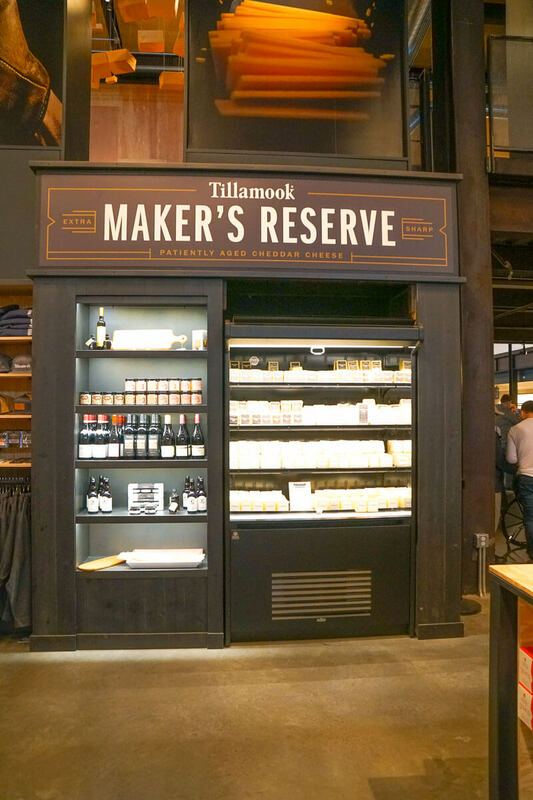 But, the number one thing you need to eat at the Tillamook Food Hall is TILLAMOOK ICE CREAM! We’ve been eating it for years and it’s really the creamiest, smoothest, most flavorful ice cream here in the Pacific Northwest! The line for ice cream can get long, but it’s totally worth the wait! 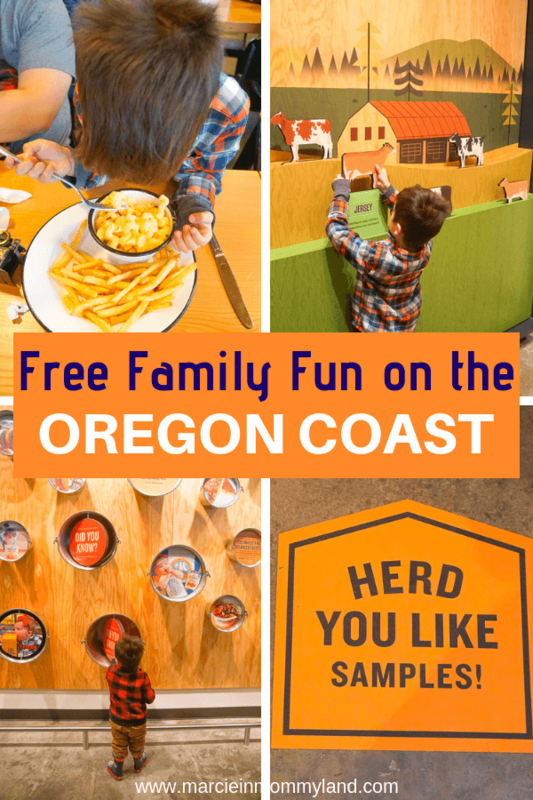 When you are looking for free things to do on the Oregon Coast, this may be the coolest option! I mean, they give you a LOT of free cheese samples and it’s a great kid-friendly activity. We went right at Noon on a rainy Saturday and it was PACKED. In hindsight, we should have tried to get here early in the morning so we could grab an early lunch. The parking lot is pretty large, but there’s a need for an overflow parking lot across the street. We ended up there on a Saturday in September. They offer a parking shuttle that runs frequently. We might have taken it had we not just put our toddler in a stroller. Although we ended up beating the shuttle walking ourselves. You might consider coming here just to eat if you are in the area. I thought the food prices were on par with food you find at museums. 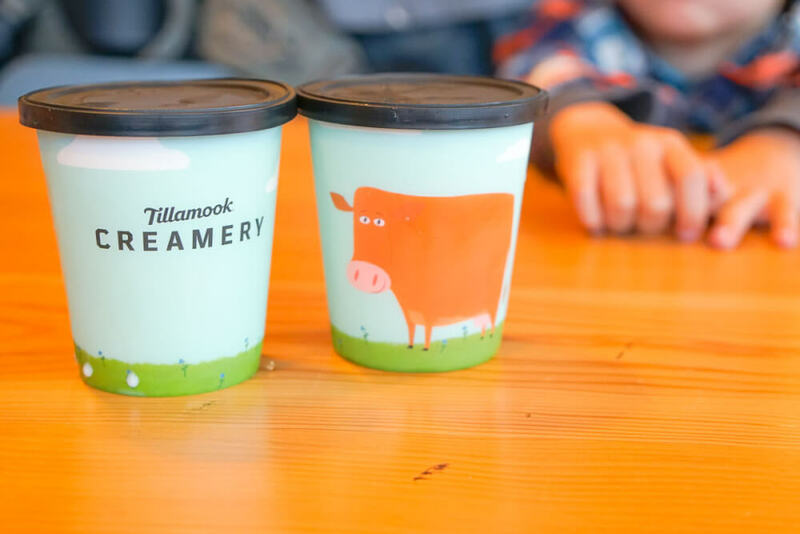 A kids cup of Tillamook ice cream was $2.50. My sandwich was $10 and super tasty! Plus, you can always grab meat, cheese, drinks, ice cream, etc from the gift shop. Insider tip: Avoid the long ice cream line by buying a box of ice cream bars to share with your family! Since we parked in the overflow lot, we put our toddler in the stroller to head over. There are elevators, so we had no problem wheeling him around. 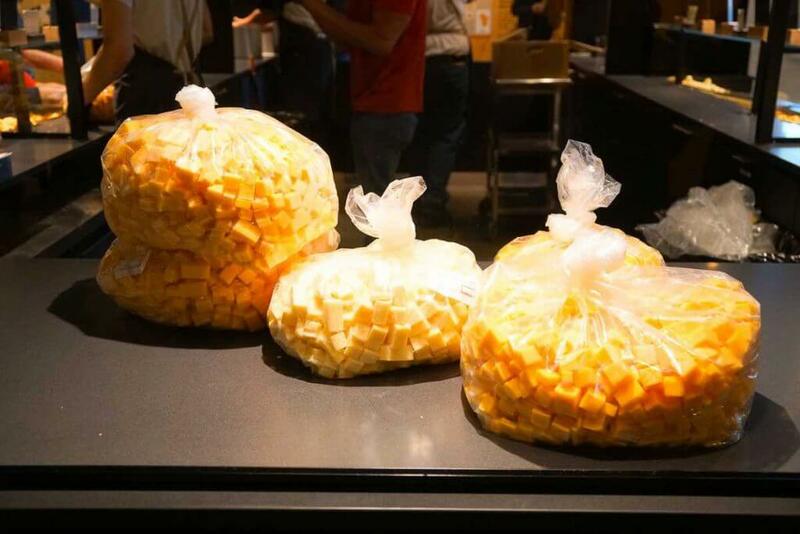 However, it was a bit cumbersome pushing a stroller through the cheese sample line and in the cafeteria area. If you have a baby or young toddler, I’d suggest wearing them in a carrier if you are going during a busy time. There’s a really cool photo op set up right behind the staircase. You can take a turn “driving” the yellow bus. 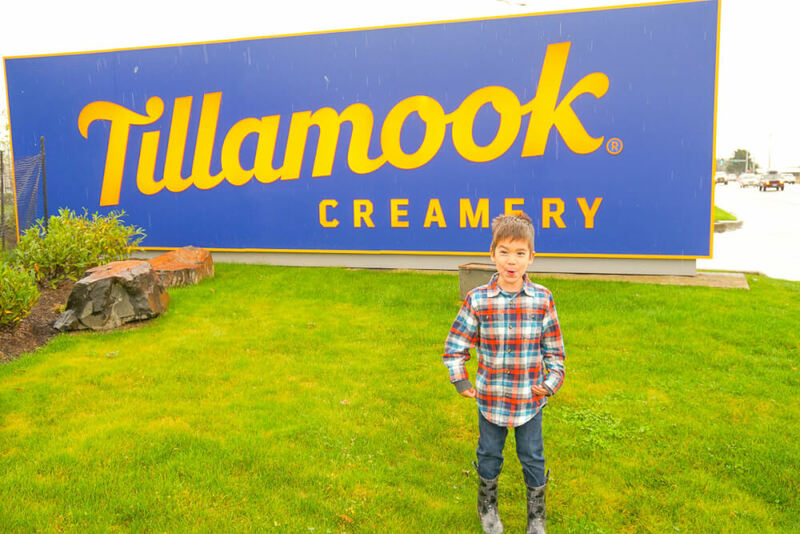 Be warned, if you want to get a photo with the big Tillamook Creamery sign, you aren’t supposed to walk across the grass. There are also no sidewalks. Before you leave, stop by the little information desk. They have free Tillamook Creamery stickers and little activity booklets. My preschooler is obsessed with the booklet because it teaches how milk gets from the cow to our house! We stayed several hours and enjoyed it all! This looks like such a great place to visit. I love all the photos! Thanks! There was so much to see! So do I! So many different flavors plus cheese curds! Yay! Glad to give you a little peek! This would definitely be a great place to visit with small kids, they would gain a lot of knowledge here,thanks for sharing. Loved all the pics. It was really interesting to see the whole process! Yes! Now THAT would be a fun place to tour! Anything that involves yummy food and an educational opportunity for the kids is a great trip for me. Your pics are gorgeous! 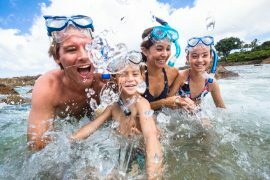 Definitely a family outing you can feel good about! Omg this place looks like the MOST fun! Such a great interactive experience! It was informative, but in a fun, easy way! This looks like a really cool place to visit. I would love to experience it. I really love the photos. 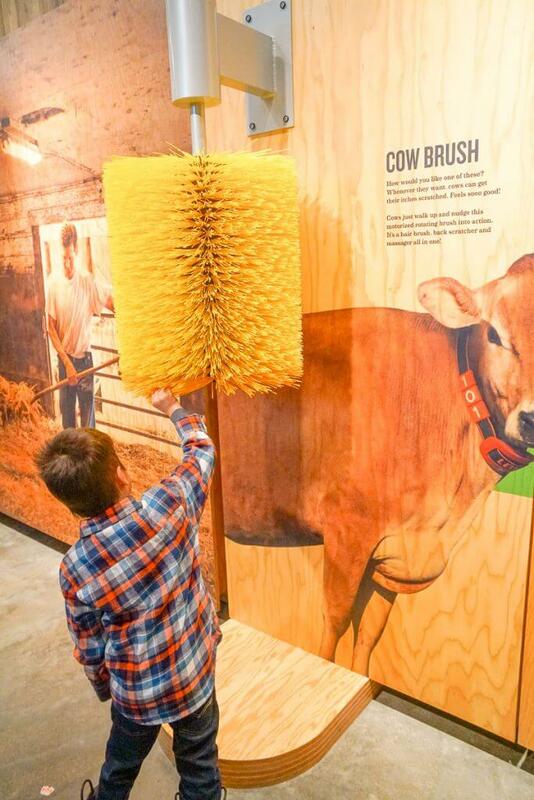 I love it when companies provide fun, educational experiences for families! I absolutely love Tillamook Sharp Cheddar. It is always my go-to when I splurge on a cheese other than basic grocery store brand. It’s so neat that you can actually tour the factory. If I am ever in Oregon, I will make it a point to do a tour. YES! I’m obsessed with their sharp cheddar! It makes the best grilled cheese! Yes, I saw a lot of couples there and I thought it was a cute spot for a date! 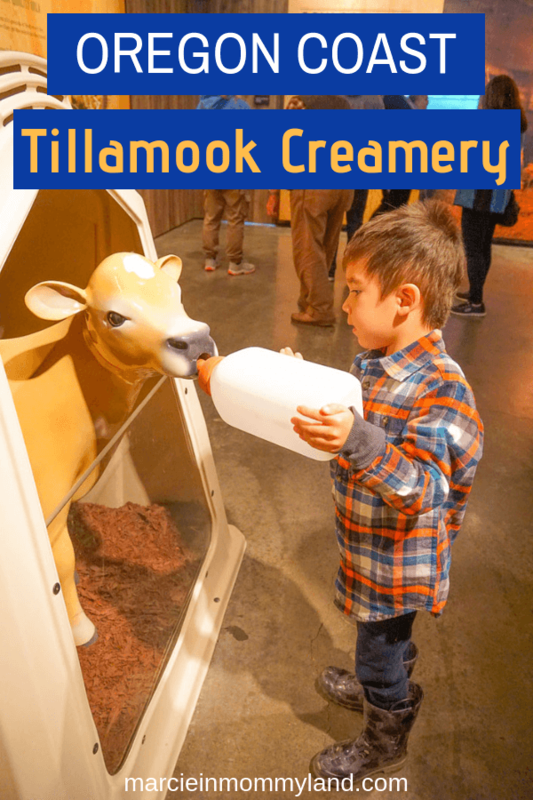 The Tillamook Creamery is a really fun family visit! 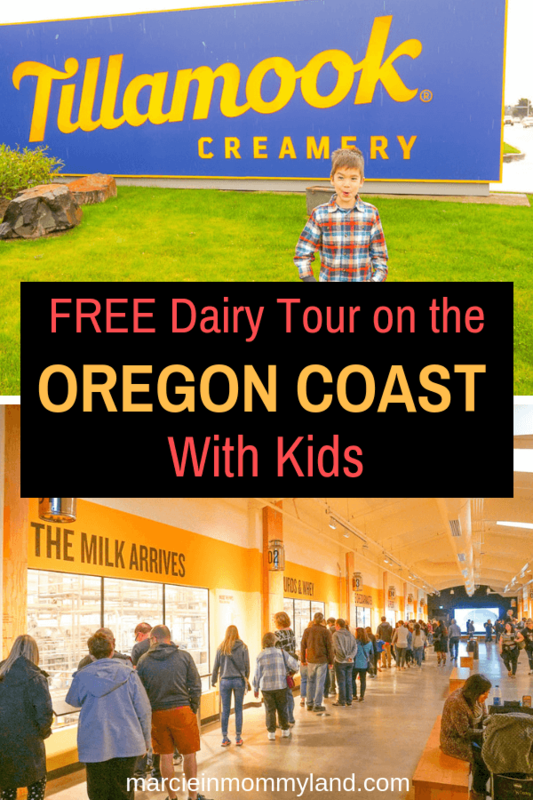 We’ve been there with our kids and the tour was very fun, the samples were delicious and my kids loved getting ice cream at the end. Great memories! I always love checking out their seasonal ice cream flavors! Yum! This look so much fun! You get to learn and experience at the same time you can have some food trips. Such a fan family trip. Such a fun and informative place to visit. I love all the educational options they have for kiddos. And all the cheese!!! Yum! Yes! Hands on learning is the best! 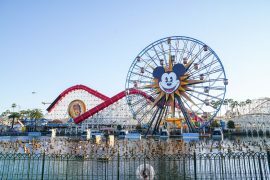 I want to go here so bad! Cheese is my favorite food in the entire world! !